This dialog box is displayed when you select the Customize menu item found at the end of a “text style” menu. Text style menus are displayed when you click the arrow button found next to a “text style” toggle. The XHTML, DocBook and DITA tool bars all start with a number of text style toggles. More information about text style toggles below. In the above screenshot, the caret is inside an emphasis element and the user clicked the arrow button next to a “italic text style” toggle. Add an item before selected item if any; at the end of the menu otherwise. Clicking this button displays the item editor dialog box. When possible, select in your document an instance of the element you would like to add and then copy it to the clipboard (Ctrl+C). This is the quickest and safest way to add an item to a “text style” menu, as the item editor dialog box has a handy "Paste Element" button. Edit selected item. Clicking this button displays the item editor dialog box. Add a separator before selected item if any; at the end of the menu otherwise. Remove selected item or separator. Restore the stock menu items. Notice that the order of items within the menu may be modified by dragging a label in the list. 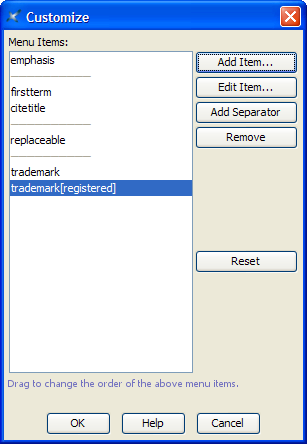 The XHTML, DocBook and DITA tool bars all start with a number of “text style” toggles. These toggles emulate the behavior of the Bold, Italic, Underline, etc, toggles found in the tool bars of almost all word-processors. Such toggles add a given “text style” to text spans not having this text style and remove a given text style to text spans already having this text style. Such toggles do not require some text to be explicitly selected. If the caret is in the middle of a word, then the toggle acts on this word. If the caret is before or after a word, the toggle acts on this text location by inserting an empty text span having or on the contrary, not having, the corresponding text style. The main difference with word-processors is that XXE's “text style” toggles supports the node selection in addition to the text selection. For example, if you want to apply a “text style” to an element in its entirety, suffice to explicitly select it. This is more handy that selecting all the text this element contains. A word-processor supports just a few text styles. A document type such as DocBook supports dozens of different text styles. (In XML, what we call a text style is an inline element having a mixed content.) That's why you'll often find next to a “text style” toggle, an arrow button displaying a menu of “text style” checkboxes. Moreover the entries of this “text style” menu can be easily customized by the end-user by the means of the Customize dialog box. 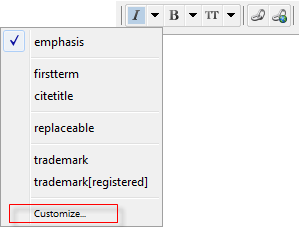 Such quick and easy customization is really needed in the case of document types such as XHTML, DocBook and DITA. For example, the DocBook “bold text style” menu contains checkboxes for emphasis[@role="bold"], abbrev, guilabel, guibutton, guimenuitem, guisubmenu, keycap, keysym. But what if a user never uses the keycap and keysym elements and often uses the application element? Answer: suffice for her/him to customize the entries of the “bold text style” menu.